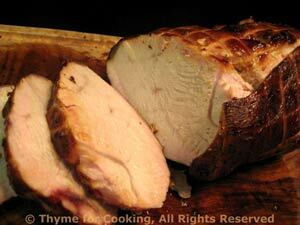 Brined, Grilled Turkey Breast, Thyme for Cooking easy gourmet dinners. Yes, I know the Allioli has a long set of instructions - but mostly informative so don't panic. The turkey needs to be brined ahead either early in the morning or the night before. The Allioli requires patience but you will be amazed at how delicious something so simple can be. Be warned: it's hot! We'll have more of the turkey on Monday. There are still a few radishes left in the markets. We've had our fill of snacking on them so I added them to this salad. If you have salad left, it's great on a sandwich! Combine tuna, radishes, celery, pickle and herbs in a medium bowl. 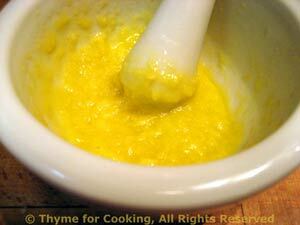 Make Vinaigrette: Combine mustard, lemon juice and vinegar in a small bowl and whisk together. Slowly add olive oil, whisking constantly to emulsify. Add tarragon and mix. Add Vinaigrette to tuna and mix gently. Set aside until eggs are done and you are ready to finish. Before serving peel and chop eggs. Add to tuna and mix gently. Arrange lettuce on 2 plates. 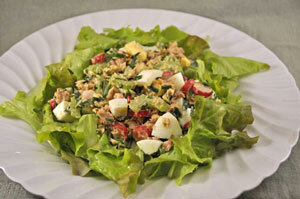 Spoon salad in the center of the lettuce and serve. I used a boneless, skinless turkey breast for this, that was tied into a roll. It doesn't need to be boneless, but do take the skin off if yours comes with it on; it lets the brine permeate better. You can tie it into a round shape or leave it as is. You could also use turkey tenderloins. Cooking times will vary according to the weight and thickness. An instant read meat thermometer is great! At least 6 hours and up to 24 hours before cooking, mix 3 cups water, salt, honey, sugar and vinegar in large, deep bowl. Add herbs and spices, stir. Add ice, turkey and enough water to cover turkey. Cover and refrigerate, turning occasionally, until ready to cook. You could also use a large, zip-lock food bag. When ready to cook, remove turkey and let air dry 10 minutes. Cook turkey on barbecue grill for 35 - 60 minutes, turning to brown all sides. Cook until 165F (75C) in the center. If you don't have a thermometer, remove after 35 minutes and cut a small slit in the center to check. A 32oz (1000gr) turkey tenderloin should take 35 - 45 minutes. Slice and serve with Allioli Mayonnaise. This is the Spanish/Catalan method, without egg yolks. It's heavy on the garlic, and very hot! Yes, garlic packs a lot of heat when fixed this way! You can cut it with commercial mayonnaise if you like. This makes about 4 tbs of allioli. It can't be made ahead as it tends to 'break' upon sitting - still good, but it has to be pounded back together. Info: You have to do this with a mortar and pestle. (see below for possible substitutes) The garlic has to be mashed. A blender or food processor will not work - you'll get a bland garlic mayonnaise. 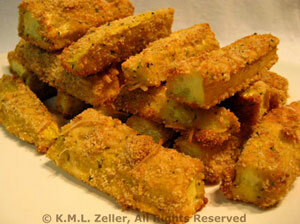 The pounding pulverizes the cells, releasing allicin which gives it the sharp, hot flavor. Method: Smack the garlic once with side of a knife to start breaking it down then put it in the mortar along with the salt. The texture of the salt is needed to help break down the garlic. Pound with the pestle until you get a paste. Yes, this will take awhile. (It took 10 - 15 total minutes for me to make this.) When you have a thick paste add the olive oil a few drops at a time and work into the garlic. Once the drops are incorporated, add a few more. Continue adding oil until it becomes difficult to incorporate then stop. If you add too much the sauce will break - the oil will separate from the garlic. This should look like a very thick mayonnaise. Simple grilled potatoes, finished with freshly made allioli. If you like garlic, you will absolutely love this... But, be careful not to use too much. In this case a little goes a long way! Put them into an old metal pie plate or cake tin or foil barbecue container (or whatever) that you will never use for any purpose but the barbecue again (you should have one of these). Cook on barbecue (grill) for 25 - 30 minutes or until done... you will need to stir them with a long-handled wooden spoon occasionally as they tend to develop 'hot spots' and can get a little crispy. When done remove potatoes and place on a paper towel briefly to remove the excess oil. 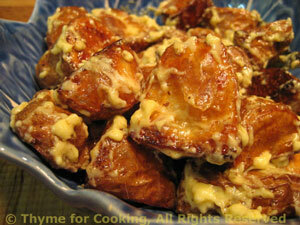 Toss potatoes with 1 - 2 tbs allioli and serve. Note: Potatoes could also be roasted in 400F (200C) oven for 30 minutes.